“Rolling Thunder” Director John Flynn Takes Robert Duvall on a Revenge Ride in 1973’s “The Outfit” – LILY & GENEROSO 4EVER! In 1978, a year that saw the release of two very well-known post-Vietnam films, Michael Cimino’s “The Deer Hunter” and Hal Ashby’s “Coming Home,” there was a third film about Vietnam veterans that I loved much more than the aforementioned efforts, a truly nasty affair called “Rolling Thunder,” directed by a virtually unknown talent named John Flynn. Flynn had teamed up with screenwriters Paul Schrader and Haywood Gould to tell the story of a Vietnam POW named Charles Rane who returns home to even more grisly reception than any character in Cimino or Ashby’s post Vietnam films. Major Rane in “Rolling Thunder” seeks revenge after his family is murdered and recruits an old friend from his days as a POW to help him out. It is an unsentimental, ugly film that is punctuated by some of the most original and intense moments of violence seen in films of that era. 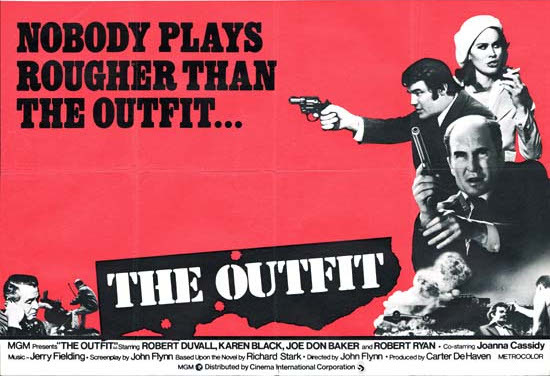 Five years earlier, John Flynn made his first revenge film, a brutal, unconventional action film called “The Outfit.” Written by Flynn and Donald Westlake (Point Blank, Payback), it is the story of ex-con Earl Macklin (played with superb quiet rage by Robert Duvall) who gets out of jail just after the titular “outfit” has murdered his brother Ed. It seems that the stint that Earl just did in jail was due to robbing a bank which was run by the “outfit,” and as payback, they have killed his brother who was also in on the job. Earl is pissed but doesn’t want blood from the outfit; he wants money, specifically $250,000, and he’s going to get it from the different illegal interests that the outfit controls, but he’s going to need help. In tow is his gal, Bett (the ethereally gorgeous Karen Black), who comes along for the ride and although she originally tries to betray Earl, Bett is sticking by his side because I guess because Earl needs someone to interpret his sullen grunts and erratic behavior. Earl also needs some muscle, so he pulls in his old pal Jack, who is played by everyone’s favorite 70s smiling southern goliath, Joe Don Baker. In fact 1973 was quite the banner year for Baker, having just starred in his biggest role as Sheriff Buford Pusser in “Walking Tall” and as another piece of nasty business, the hitman Molly in “Charley Varrick.” Together they hit the road and try and to make revenge happen, one score at a time. “The Outfit” progresses in the same way that many revenge and action films do, but it is the construction of the three main characters above along with the multitude of film noir veterans that Flynn populates this film with that really makes it watchable. These immensely talented actors bring so much to the smallest amount of screen time. Character actor Elisha Cook fills up a scene as does the great Jane Greer, who plays Earl’s grieving sister Alma. As for our Mr. Big, Mailer, Flynn went with an actor who spent an entire career playing villains and heavies, Robert Ryan. Mailer runs his empire with a dour, unhappy tone similar to that of our hero, Earl. Like Earl, he also is not too thrilled with his woman, and like Earl, he especially isn’t pleased about getting threatened. After Earl demands his appeasement in the form of 250 large, Mailer agrees to the amount, but then welches so you shouldn’t be surprised when Earl and Jack do not go away quietly. The welch happens in one of the most interesting action scenes in the film, which takes place in a homeless shelter. As the deal goes awry, a fire alarm is pulled, and a sea of homeless men, firemen, and thugs flood the street as Earl and Jack make their escape. It is that scene and the many shakedowns that Earl and Jack perform that highlight Flynn’s unique directing style in this genre. The action is never too slick; Jack and Earl are not flying out windows on jetpacks here, nor are they comical as they dole out violence, and there are some dialog inconsistencies for these brooding, silent characters, but all in all they say what needs to be said and not much more. They are professional and do what they have to do in get the job done. There is a large amount of violence in the film, but it is rarely gratuitous, as in one early scene when Earl blows the hand off of a member of the outfit for burning his woman Bett with a cigarette. Though shocking, I think that goes far in setting up that character’s limit for vengeful acts. Though “The Outfit” tips its hat to film noir with some of the characters, the primary structure is that of action and to be more specific, a 70s buddy film. As with many 1970s buddy films, the women are not femme fatales, but they also only get to hang in the background for most of what happens during the course of this film. Though Bett is a fully flushed out character, she doesn’t get into the action that often and is curiously absent from a few key scenes. This is something that Flynn definitely would improve on with in his later film, “Rolling Thunder,” with his character named Linda, a gun-toting Texas woman who does a lot more than just tag along. Unlike the films of the early 1970s, women’s liberation was in full effect by the late 1978, even in male dominated action films, so Linda can thus be a fairly tough customer. Given that “The Outfit” was shot in 1973, Bett does get to plow into some bad guys with the car, but otherwise, she seems there to just provide a voice of reason and in one brutal scene, she even becomes a punching bag for Earl. Like Flynn’s “Rolling Thunder,” “The Outfit” is completely unapologetic about its male character’s actions. These are tough, insensitive men who almost seem anachronistic even for 70s film standards, which should make this an uncomfortable watch for a lot of folks. If you’re me, when you think of early 70s manly films about revenge, you almost immediately think of Mike Hodges superb 1971 British gangster film “Get Carter.” And although “The Outfit” is not as tightly woven together as “Get Carter,” it does have the same caustic intensity and shocking violence of Hodges’ film and is well worth your time for nothing else if only to see a solid performance from the always brilliant Robert Duvall in the middle of two major films: the career-making Godfather and the nifty Conversation.